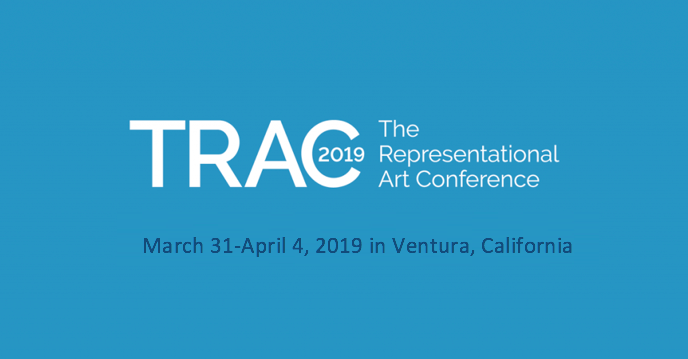 They met at TRAC 2018 in Leeuwarden, the Netherlands, which prompted an ongoing conversation about art. To you, is there a difference between “representational” and “realist/figurative” art? To me, the realm of realism is quite broad, encompassing most art in which I can tell what the hell I’m looking at. In other words, art where I need no translation by artist or critic. For me realism—a term that is now often considered to be underpinned by a very specific conception of mimesis or illusion—is a small branch of figuration/representation, but I often see the terms representation(al) and realism being used interchangeably, which I find problematic. It opens up the question of what representation really is. I personally have a bias toward work where there is something recognizable, i.e., rooted in my experience of the world, but where there is also a clear intrinsic logic. In painting, that logic is all about the materiality of the mark making and how those marks relate to one another in two dimensions. Would the work of Frank Auerbach or Edwige Fouvry—both of which I find stunning—fall under the term realism for you? What kinds of thing get you really excited about a piece of work? Fouvry’s and Auerbach’s works are, to me, a form of realism, but I’m generally more drawn to precision. I’m attracted to high technical skill and I also want to see a multifaceted thought process. I want a certain deliberate care in mark making and I need to see a form of elegance. This spans from crisp hyperrealism all the way to work such as that of Yael Maimon, which has a raw, spontaneous expression that manages to impact me through not only dexterity but also beauty. What gets me excited is just that; a combination of expertise, beauty (even when it is ugly), elegance (some kind of visual rhythm, pleasing lines), the capturing of color and value that is right on the dot. I also really enjoy art made up of composites, creating a brand-new reality out of atypical subject matter. In a way this happens in my own still lifes with birds—the Tempus ad Requiem series—in which I merge components that never existed together. 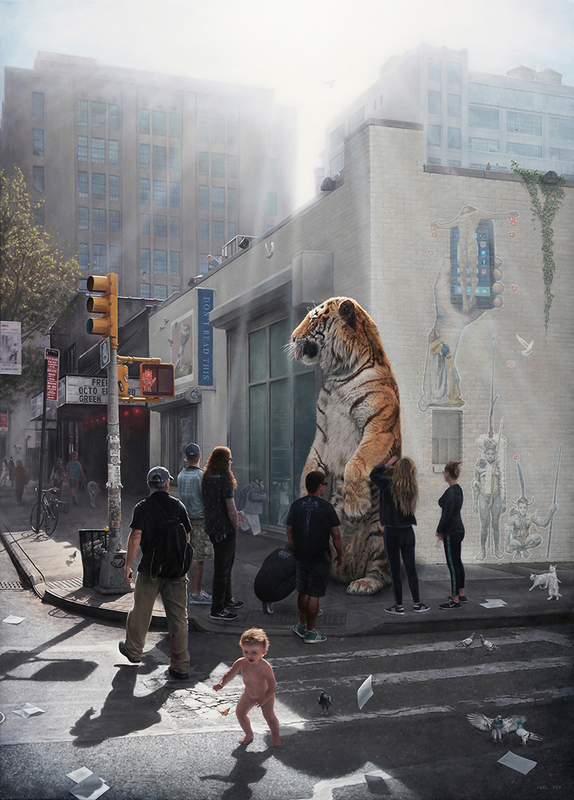 Joel Rea and Jeremy Geddes are masters of creating new realities that are not only exquisitely painted but believable. I understand what you mean about high skill and multifaceted thinking. 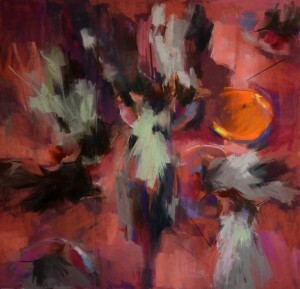 I like things that are not closed, not too precise, where the painterly logic takes a prominent role. If I start noticing the skill of what’s before me, the magic’s already waning. 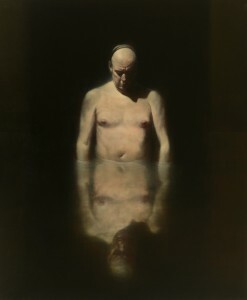 Contemporary painters who I have at some point got a real buzz from include Ken Currie, Adrian Ghenie, and Celia Paul. I agree with you that there is something really exciting about work that chimerically constructs a new world in a way reminiscent of magic realism in literature, but for me there still has to be a palpable painterly quality. I do wonder if that painterly logic is part of a language becoming less accessible in a world where digital devices flatten and miniaturize images. And this comes back to the idea of immediacy, readability, narrative content… Knowing what the hell it is you’re looking at! And yet, I think that as human beings, part of our existence is defined by playing in the mud and making handprints on walls. In a world where we are bombarded with images, like you say, mostly presented digitally, in small format and often over-enhanced we miss out on the tactile, visceral impression of looking at art in person. 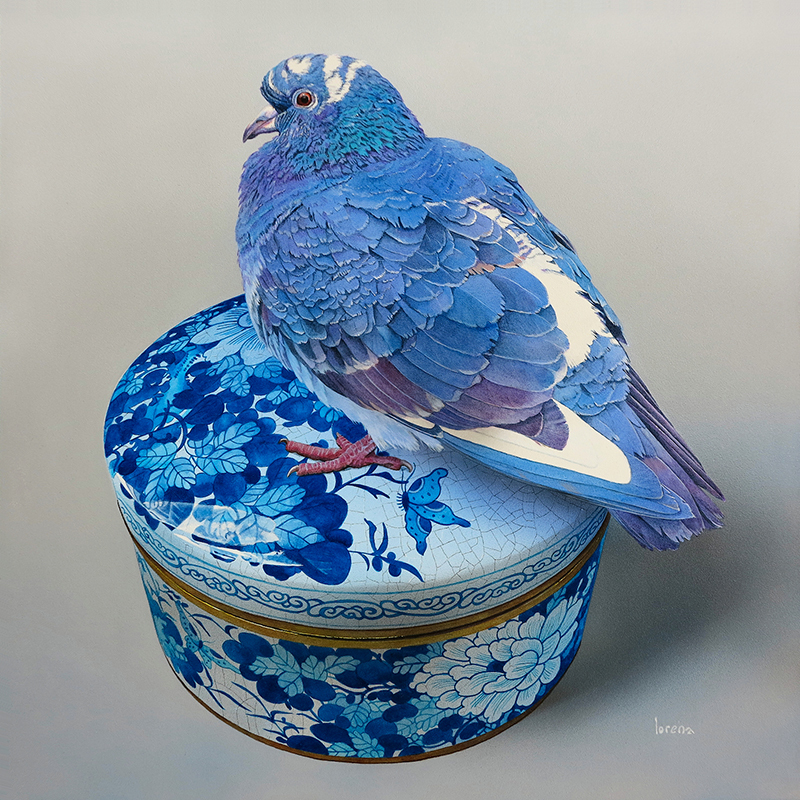 In view of this, what’s the next step for representational art? Where is it going? We play in the mud, yes. Some artists invent new methods that become gimmicks and get copied. Is it more important to be innovative than to have a recognizable “brand” style? We are all building on our own art history and there’s a healthy amount of cross-pollination between artists—both living and dead. We learn by looking at art, not only technical stuff but ideally, we learn about ourselves. A person’s opinion, critique, or assessment of an artwork says more about who that person is than about the art itself. What do you think? Is art a way to self-exploration? And how does this work when we create art ourselves? Are we saying something about who we are? Or can it be a mask? I have always thought of human beings as a bundle of neurosis with two legs. So what comes out of us is going to be forged by our personal point of view, making the results of creation chaotic, diverse, and fascinating. We all approach our lives with a baggage of cognitive biases and a whole constructed net of ethics and values, and a person’s approach to their work is inextricably entwined with this value system. So, the work we make is inevitably a form of self-expression. It can be a mask in many ways. Either in the sense that we are all constructed identities made up of myriad facets, and fundamentally there is no immoveable “truth” to pin down. But it can also be a constructed mask, a consciously artificial projection. Personally, I think this is where figurative and representational painting becomes fascinating. There is something fundamentally absurd about wanting to represent a lived experience, memory, or idea fueled by our experience of the world—all of which exist in at least four-dimensions—on a static two-dimensional surface. It seems inevitable that anyone who chooses to paint has to, at some point, confront the very absurdity of painting. 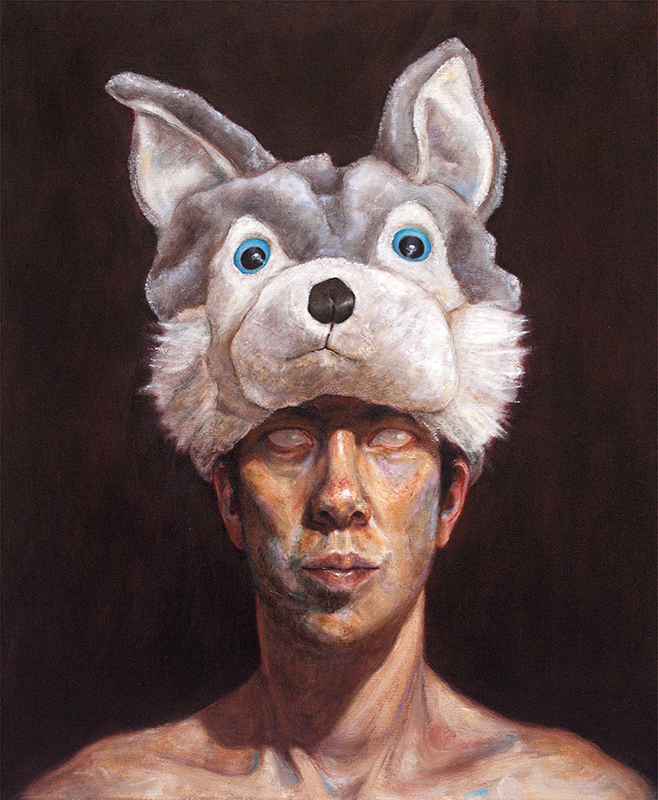 It palpably becomes a human construction, and an exploration of a specific form of expression. As such it is a question which asks you to position yourself in relation to the act of making within the very constraints you choose. All of the conventions, including for example perspective, then show themselves to be just that, conventions. I’m really not sure where figurative and representational art is going… Was it ever going anywhere? Does it have to go anywhere? My cynical side thinks it is veering towards readability and comfort (the aspects I personally don’t value so highly). 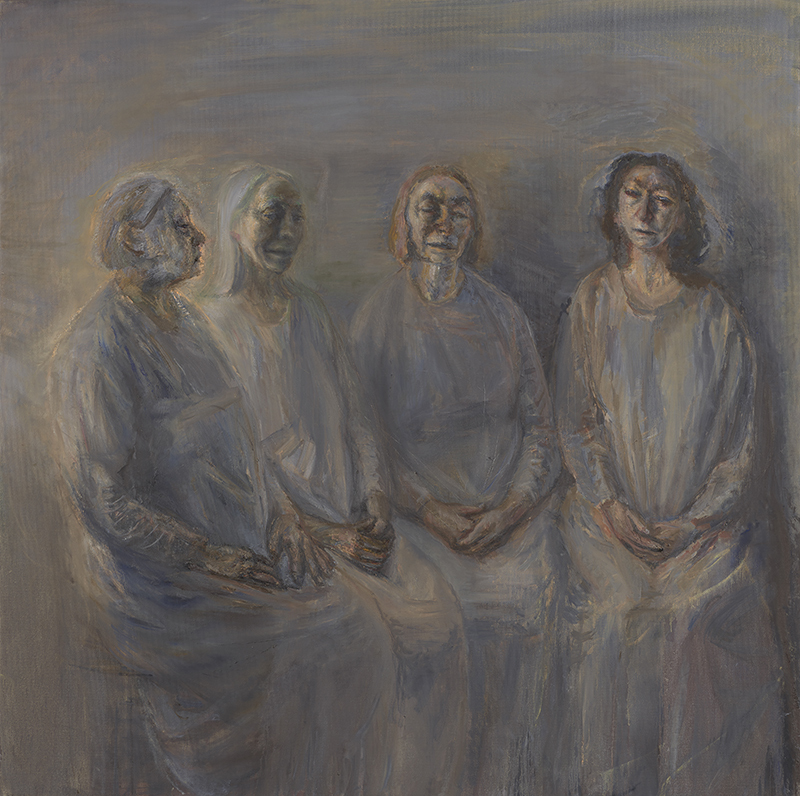 I find hope in Michael Pearce’s notion of emergence and the analogy of bubbles… In one bubble I am sure people are swimming around in bright thick pigment making form and content collide into a figuration which is unstable and aware of its own artifice; that’s where I want to be right now. Which bubbles are calling you to dive in? My bubble is the one where beauty and symbolism meet, but I certainly wouldn’t mind crossing over to other bubbles if my creative path takes me there. I’m open to wherever the brush takes me. I would love to see all those bubbles sparkle and collide like fizzy champagne, all finding a place to shine, all finding a particular audience without the need for rivalry. I also yearn for a time when dogmatic thinking inside the realist/figurative genre is cast aside. Although each artist has her rules and tastes, they do not need to be imposed on other artists. We need to be more accepting of fellow artists and their individual search for their own creative path. We all walk alone in the end. So, on those rare occasions when we come together, I believe it’s always more important to be supportive than critical—to ultimately connect on a profound personal level. And celebrate all our exciting differences.